I am a massive Total War fan, but that fandom comes with the knowledge that the games are far from perfect. And near the top of the list of things wrong with Total War has long been the series' janky AI. It's famous for making stupid moves (though this is often improved by mods), but for me the most damaging aspect of Total War AI has long been its inability to hurdle certain obstacles. It can march armies over fields and hills just fine, but over the last five games you'd have more luck getting gold from lead than trying to move your infantry along a castle wall, through a siege or off a boat. So when I started playing Total War: Attila last week, hopes weren't high. I'd found Rome II to be the most disappointing Total War in a long time, and this appeared to be little more than a glorified expansion for it. For the most part, that's how it panned out. 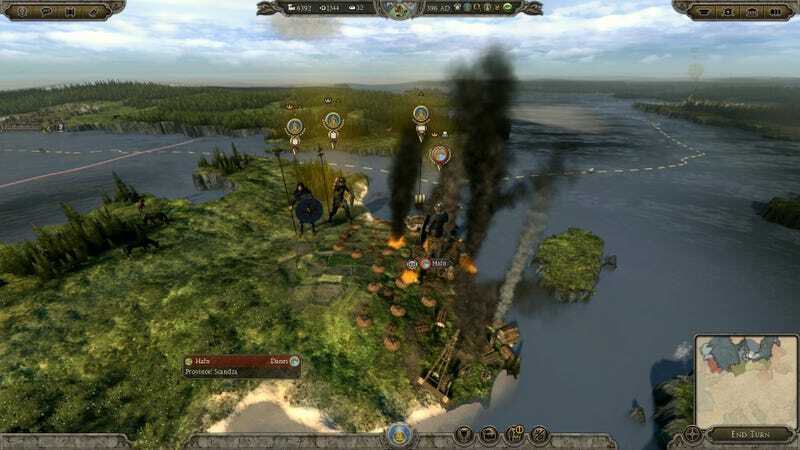 Attila is as drab as Rome II was, burdened by too many distracting civic systems and slowed by a map that's too big and contains too many factions. And yet, in that times the game manages to rouse itself into a moment of excitement, I found the strangest thing: it works. Armies in a siege actually did what I wanted them to. Armies getting off boats actually got off the boats. Units maintained some sense of cohesion while marching through city streets. It's not perfect — the AI will still do some silly things — but in terms of those absolutely broken elements from the past few games, this is a big improvement. These kind of fundamentals sound like things you expect from a blockbuster strategy series, but when it comes to Total War, they're not! They're things fans have learned to avoid, or compensate for, because this wonderful series is also kinda busted, and the more you play of it the more you realise you've got to take the good with the bad. So Attila is a weird game to play. It's the anti-Total War game in a lot of ways. Titles like Empire and Shogun were all about character and colour, which you loved so much you could endure the times the AI just completely shat the bed. And yet here we have Attila, which like Rome suffers from a severe deficiency in character and colour, only to somehow fix the other half of the equation and get most of its AI working. Who knows, maybe next time they'll be able to pick all the stuff that has worked well over the last three Total War games and get everything right?